Jacqui used Amy Butler’s Soul Blossoms Home Decor fabric Trailing Orchid Grass. She made her own binding using Amy Butler Soul Blossoms Temple Doors Fresh Mint. 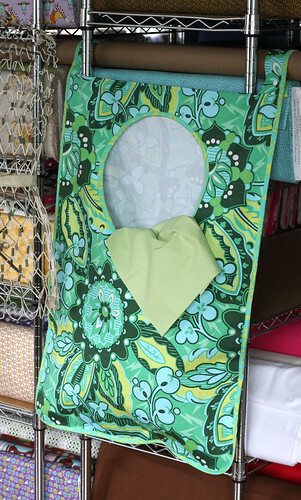 The pattern uses the entire 36″ length of fabric. Jacqui pre-washed her fabric and found that it shrunk. Her solution was to shorten the over all length. For example, she cut the front piece to 31″ in height instead of 32″ and the longer back piece 27″ instead of 28″. 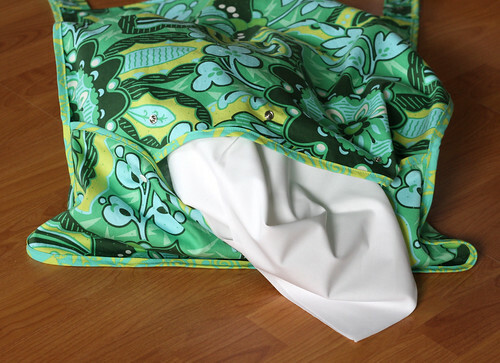 The Home Decor fabric provides durability. 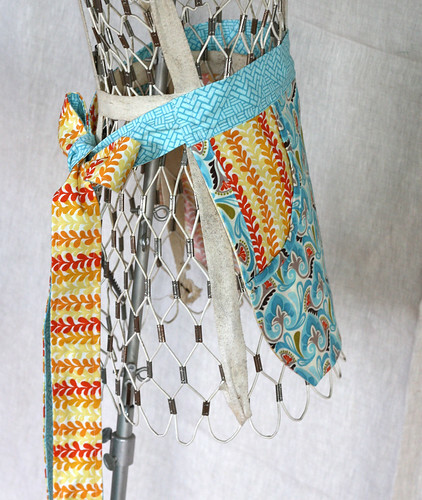 Jacqui preferred a straight stitch to a zig zag stitch when applying her bias tape. It was helpful to stitch the back and front pieces together before applying the bias tape. Encase the upper raw edge . . . Position the two back pieces, right sides up, so that the lower piece overlaps the upper piece by 4”. Baste together. . . The Hanging Laundry Bag was a great project. We were all surprised at how large it actually was. Jacqui thought it would be great to take on vacation to replace the garbage bag for dirty clothes in the suitcase. When she is not traveling the bag will provide great color in her laundry room. Diana selected fabrics from the new Kate Spain Central Park Collection: Trefoil Aqua, Hernshead Yellow and Cobblestone Aqua. A collector of sea glass, Diana is inspired by the amazing colors in Central Park. Diana chose 3 different fabric prints just for fun, 1/2 yard of the 2 main fabrics and 1/4 yard for the waist band and tie. 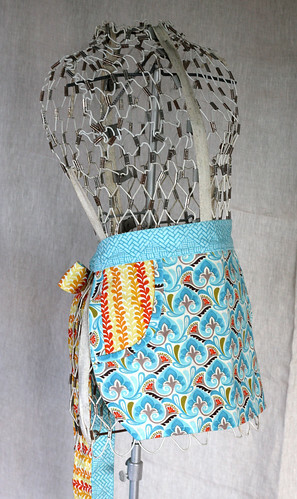 The apron can easily be made with one yard. The corrections clarified the pattern nicely and were easy to follow. The new diagram was especially helpful. Diana top stitched the waist band to give the apron a nice finished detail. Diana can’t wait for the right tide so she can use the apron to collect sea glass on the beach. Place the apron front on top of the apron back with both wrong sides facing up, matching the notches at the top edge, and pin in place. Press one long edge of the apron trim 1/2? to the wrong side. Position the right side of the apron trim on the wrong side of the stacked apron front and back pieces. Raw edges of the apron trim will align with side edge of the stacked apron front and back pieces. Note that the apron trim will overlap the apron front by 1?. Stitch through all layers around the curved edge of the apron, leaving the top notched edge open. Trim entire seam allowance to 1/4″. Clip to but not through through the seam along the rounded corners to ease fullness. Turn the apron right side out and press curved edges. Fold the apron trim to the front. Press and pin trim in place, ensuring that it covers the trimmed seam allowance. Topstitch around the finished curved edge of apron at 1/2?, making sure to catch the edges of the apron trim. Match notches at top edge of apron and baste in place using a scant 1/4? seam from pocket edge to pocket edge.